Why is it important to keep electric appliances and tools away from water? Remember this simple rule: water and electricity are a potentially lethal combination. 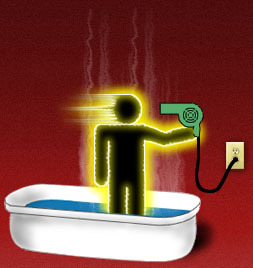 Stay away from water when using electrical appliances -- standing in a tub of water or shower and using a blow dryer or curling iron could result in electrocution. 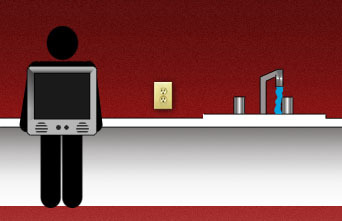 Many consumer products such as hair dryers, electric power tools, TV sets, radios and small kitchen appliances can easily become electrical hazards if they come in contact with water. They are not designed to operate when wet. The best idea is not to use these appliances anywhere near basins, tubs or sinks that hold water. If an appliance does contact water, say the blow dryer drops into a sink full of water, do not reach into the sick of water after it. This could cause an electrocution. Unplug the blow dryer or turn the electricity off at the fuse or breaker box before you retrieve the blow dryer from the sink, even if the dryer is in the "off" position.